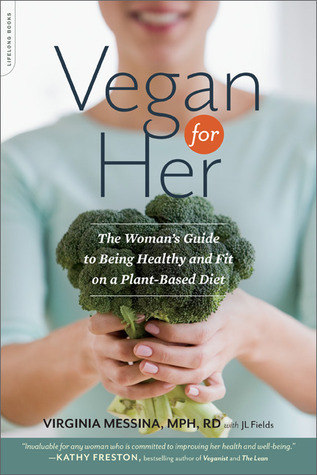 Vegan for Her by Virginia Messina, MPH, RD. Publisher: Da Capo Press/ Lifelong Books (2013). Health and Fitness/ Diets. Softcover. 382 pages. ISBN 978-0-7382-1671-3. Useful information for vegans and those transitioning to or considering a vegan diet. Well-organized and addresses life stages and health issues that most concern women. –Vitamin B6 is needed for the synthesis of certain neurotransmitters, including serotonin (low serotonin levels have been implicated in depression). Vegans get plenty of B6 through diet sources such as bananas, avocado, potatoes, leafy green vegetables and soyfoods. –Vitamin B12 is needed for nerve cell function and inadequate intake leads to neurological problems including cognitive decline and depression. Vegans need a supplement of 25 mcg daily. FTC Disclosure: I received this book for review from Da Capo Press. This entry was posted on August 7, 2013, 05:18 and is filed under Books, vegan/ vegetarian. You can follow any responses to this entry through RSS 2.0. Both comments and pings are currently closed.